Clement Calhoun Young was born in Lisbon, New Hampshire and moved to Butte County when he was 1 year old. His family later moved to San Jose where Young attended high school. He graduated from the University of California in 1892, and started his career as a school teacher of English and Latin. After starting at his alma mater, Santa Rosa High School, Young switched to the oldest public high school in California, San Francisco’s Lowell High School. In 1906, Young switched careers and began work at Mason-McDuffie Company, which dealt in real estate, insurance and loans. He entered politics when he was elected to the California Assembly, serving five terms from 1909 to 1919, and was Assembly Speaker from 1913 to 1919. He was elected lieutenant governor in 1918; a post he held for two terms. On November 2, 1926, he was elected governor, and on January 4, 1927, he was sworn into office. During Young’s term the Metropolitan Water District was formed, encompassing 13 cities and procuring water from the Colorado River. Prisons for females were built, classes began at the new campus of the University of California, Los Angeles, and the St. Francis Dam collapsed, causing an enormous amount of damage and killing over 500 people. 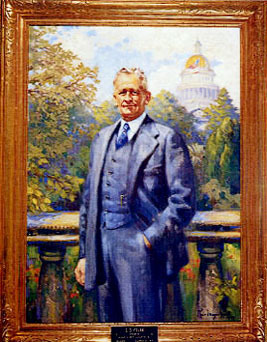 With the unanimous approval of the Legislature, Young signed into law a state park bill in 1927. In 1928 Californians approved a $6 million park bond act. Young ran for a second term but lost to Frank Merriam, and left office on January 6, 1931. He retired from politics and returned to his business in real estate development at the Mason-McDuffie Company. Young died on December 24, 1947 in Berkeley. Use the California State Library’s interactive tool to view Executive Orders and Proclamations signed by Governor Young.